Come meet the artists, makers and designers at our SUMMER 2013 Pullens Open Studios. 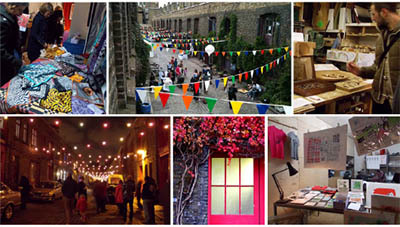 In our 50+ studios in three beautiful Victorian yards, you’ll find printmakers, painters, ceramicists, jewellers, lute makers, furniture designers, graphic and web designers, architects, fim makers, gallerists, photographers, letterpress printers, paper conservators, book publishers, prop makers and fashion designers. There are few places in London with such a concentration of creative people. We open the studios twice a year – at Christmas and in Summer – to display and sell our wares, with prices at every level. The Electric Elephant cafe is piled high with fresh muffins and cappuccinos and there is live music. Many studios serve wine and nibbles. Bring the family! This year we’ll host ART WORKSHOPS, there will be local honey and a beehive display from Bee Urban, plus more rescue owls than ever. This summer we’re also part of Open Garden Squares weekend, 8,9 June 11am-5pm. Iliffe Yard Garden is in a cluster of gardens in the area, including Fielding Street Allotments and the Walworth Garden Farm. Pullens Studios is made up of 3 yards: Iliffe Yard, Peacock Yard and Clements Yard. 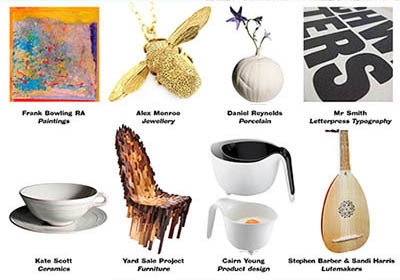 The Pullens is home to many celebrated artists, designers and makers, such as painter Frank Bowling (OBE, RA), jeweller Alex Monroe (of the must-have bee necklace), ceramicist Kate Scott (who is now making pieces for The Conran Shop) and more. Come and experience the wonderful atmosphere of this creative community. Find out more information about Pullens Open Studios. This entry was posted on Thursday, May 9th, 2013 at 10:12 am and is filed under Open Studios. You can follow any responses to this entry through the RSS 2.0 feed. Both comments and pings are currently closed.